NEW DELHI: It's about a fortnight since police raided the home of Delhi University teacher G N Saibaba. The Ram Lal Anand teacher, police have alleged, is "an urban contact" for Maoists. He was asked to appear before the Maharashtra Police "out of Delhi or at Nagpur" by Wednesday. However, pointing out that he is 90% disabled and uses a wheelchair, he asked the cops to conduct their " enquiry" in Delhi. From Tehelka: "We have a common enemy in Delhi"
Why did you attend the conference demanding secession of Kashmir?What connects the Kashmiri separatists to Maoists? I feel azadi is the only way for Kashmir. Self-determination is the right of every nationality. Being a Maoist, I support revolutionary and independent movements of people. On that Marxist-Leninist principle, I support the nationality struggle of Kashmir and of the Northeast. I come from the Hyderabad riyasat. Both Hyderabad and Kashmir were invaded by India. Even the Indian Union uses the word ‘accession' in both cases. They annexed Hyderabad on the pretext that the rulers are Muslims and the ruled are Hindus. In Kashmir, they said the king is Hindu. In both places, they played the Hindu card. Kolkata, May 20 (PTI) The West Bengal government today said it has received a preliminary report on the alleged assault by CRPF personnel of journalists at the landmine blast site at Ramgarh in which five CRPF personnel were killed. "A preliminary report was submitted, but I have not gone through it and cannot say what happened," Chief Secretary Ardhendu Sen told reporters when asked about the incident. The Press Club Kolkata condemned the assault on the journalists that allegedly took place yesterday. One night in May, about 100 policemen marched along a dirt road in the hills of central India to the village of Gumiyapal, hunting for Maoist insurgents. Jimme Midiyami and her family were eating their evening meal of rice and lentils when they heard the shooting begin. She looked outside and saw a line of men emerging from the forest at the edge of her paddy field. 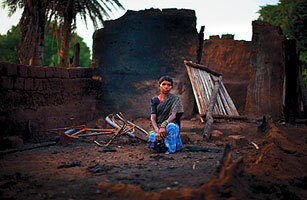 "The police came, we left our food and ran to the next house," says Midiyami. "We were so scared. We didn't think we'd be spared from the firing." THE Central home minister P Chidambaram has often issued veiled threats to intellectuals who offer covert or overt support to the Maoists, whom the Prime Minister Manmohan Singh has identified as the ‘biggest internal security threat to the country’ today. While Singh and Chidambaram have limited themselves to issuing threats, the top brass in the Karnataka Government has opted for direct action. The police of Shimoga district has issued a ‘threatening’ notice to a young Kannada journalist. Local journalists have been beaten and prevented from covering recent unrest in Indian-administered Kashmir. More than 100 people have died since June during clashes between security forces and anti-government protesters in some of the bloodiest scenes the disputed state has seen in years. Sajjad Haider, editor of The Kashmir Observer in Srinagar, describes what it is like for journalists trying to cover the deaths of members of their own community while under curfew. A local journalist working for the BBC recently had to get his pink-coloured curfew pass, specially designed for the press, replaced with one meant for those attending marriage ceremonies in order to reach me at my home in curfew-bound central Srinagar. A considerate police officer had told him that this was the best option if he wanted to escape the wrath of the security personnel enforcing the curfew on the streets.The treatment of local reporters by the authorities is in contrast to that received by visiting correspondents.They have come to be known locally as “embedded journalists” and are accorded full assistance by the state government to move around freely in Kashmir. Local journalists covering the unrest – and living amid it – were banned from moving around during the curfew while permit cards issued to them were cancelled. The Kashmir Press Association recently said this amounted to an “unwritten ban” on local media outlets and accused the government of adopting a discriminatory attitude. ”Scores of local journalists have been thrashed while discharging their professional duties,” it said. Not long after, Chief Minister Omar Abdullah had to apologise when a well-known local journalist was beaten by police. An investigation was announced – but regrets and promises of probes are not new for Kashmir. The fact is the situation for the media has not changed a bit here. For me, journalists working for local newspapers are exceptional individuals operating in exceptional circumstances – without any safeguards and guarantees either from their respective organisations or from the state. Calls for “Azadi” (freedom) probably ring in the ears of Kashmiri journalists even when they are asleep. 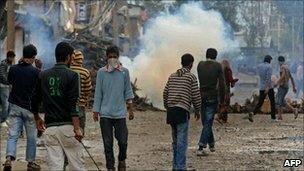 On 11 June, mass civilian protests erupted in Srinagar when a 17-year-old boy died after being hit on the head by a police tear gas canister in the congested old part of the city. A month later, local journalists joined the calls for freedom, demanding their own liberation. Killings had happened before, but why the outcry this time? Actually, on 11 June there was not one death, but two. After the boy died, police sought to put the blame on those who had tried to rush him to hospital to save his life. The police killed the boy first – and then killed the truth. The real catalyst of the current uprising in Kashmir is not so much the first killing as the second. Undoubtedly, the present situation is a continuation of events that have afflicted the region for the past 20 years. All it needed was a spark. It is a bid to break free of the suffocation in which people find themselves here. The haunting question is how much the Kashmiri media have lived up to the expectations of their people. The bitter reality is that, while it may have progressed over the last 20 years, it has not become completely free. The absence of private businesses in Kashmir, the dependence on government advertisements, the government’s monopoly on the flow of information and the fear of reprisals are all factors which have prohibited the growth of a fully free media. So local reports are sometimes constrained to give space to propaganda alongside the facts. For example, on 24 September the Jammu and Kashmir police rejected media reports that 2,000 people had been injured in police and paramilitary action during 105 days of unrest. Questioning the figures, a spokesperson for the police said that only 504 civilians had been injured. But according to him, the number of police and Central Reserve Police Force personnel injured was nearly 4,000. However, according to the register of one single hospital in Srinagar (the SK Institute of Medical Sciences), 599 civilians with firearms injuries had been admitted during this period. There are dozens of other hospitals treating the injured in the rest of Kashmir. In Kashmir today there are about 25 news channels available – but not one of them is Kashmiri. The local media are limited either to newspapers or to a handful of cable channels. As if that was not enough, the government appears terrified of what remains of their freedom. Curfew passes were issued to accredited journalists only, as local authorities do not recognise the non-accredited journalists who form the bulk of the journalist population here. The tough accreditation rules they have formulated make it virtually impossible for local newspaper reporters. How can newspapers be circulated when there are severe restrictions on public movement? The problems are not all to do with government curbs – Srinagar-based newspapers have had to suspend publication at times because of a lack of advertisements as well. The reality is that newspapers, which heavily rely on the revenue from government advertisements, are facing huge losses and many publications have had to lay off staff. Many newspapers are on the brink of closure as the separatist strikes coupled with government curfews have closed whatever little private advertisement flow was coming their way. It makes it all the harder to meet the expectations of a people who feel let down by their own media. You could say so. I am a product of the peoples' movement. I am a self-proclaimed anarchist. I am a political man by all means but not a man of politics. The Singur-Nandigram uprising brought me to the centrestage of West Bengal's anti-government politics and I was persuaded to contest an election by some well-meaning friends and a large section of the civil society as well as Mamata Banerjee. Everyone thought I was just the right man to function as the 'people's voice' in Parliament. Little did I know then that for a first time MP, to be able to raise a point in Parliament is almost impossible. Add to it the fact that I was continually harassed, humiliated and slighted in public by a section of the Trinamul Congress leadership. I couldn't take it any more. I was losing my identity. 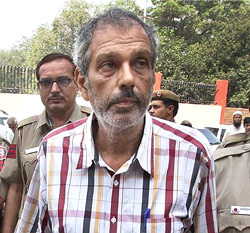 NEW DELHI: Maoist leader Kobad Ghandy has been in custody in the Tihar jail for months now, but his views on development seem relevant for those trying to address the issue of inclusive growth. Sitting in his jail ward, Ghandy, one of the senior members of CPI (Maoist) politbureau and known for his intellectual inputs to the Maoist movement, presented a paper at the National Seminar on Development on Monday. The two-day seminar, which ended on Tuesday, also had representatives from corporates like Microsoft India and the Tata Group, who tried to find ways of development that could include the masses. Interestingly, the seminar — organised by Forum for Promoting Inclusive Growth — that included speakers like CPI leader Sudhakar Reddy and civil society members like Sujato Bhadro among others had Ghandy’s eight-page hand written paper read out. Apologising for not being able to write a better paper than the one that was presented for “lack of access to relevant information in jail”, he quoted profusely from government data as well as from UN reports to build his case that there is tremendous imbalance in development in the country. He quoted from the Atharva Veda and the Bible to explain the need to maintain an environmental balance while undertaking overall development. NREGA, he explained, involves 36% in Tripura, 14% in UP and MP, 8% in Chhattisgarh, Jharkhand and Bihar. “So where did all the money go?” he asked. He accused the government for not even building proper infrastructure for storing food grains, which are rotting when so many people go hungry. Hello and welcome to CNN-IBN special in the aftermath of killing of 76 CRPF jawans in Dantewada by Maoists, there has been a nationwide debate which has been polarized one. One argument is to about to use maximum force to crush the Maoists and the other argument is about to initiate outreach program, democracy and rehabilitation. Joining us here is the author and the activist Arundhati Roy, who has written several writings on Maoists and her open sympathy and empathy for them, has created a great degree of debate and controversy. Thanks very much indeed for joining us.